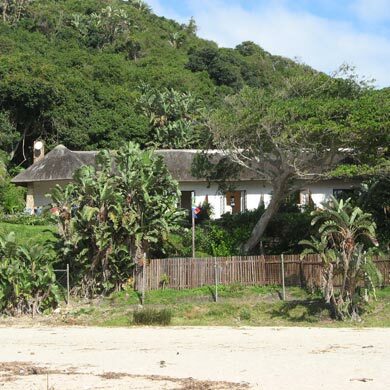 Originally a farmhouse, the Lodge on the Beach was built in 1929 and is one of Port St Johns' oldest, quaintest buildings. Set in a lush subtropical garden, we are a 3-bedroomed guesthouse offering accommodation right on the beach, with a spectacular view across the bay. We also organise activities ranging from gentle guided walks to extreme mountain biking. We look out over The Gap, a geological feature which formed as a result of Continental Drift. A slice of headland suddenly sheared off the African continent during a prehistoric upheaval, and over the ages the 30-metre gap has almost filled up with rocky debris. It has an accompanying Blowhole near its base, which shoots a jet of water 20 metres into the air. Both are iconic Wild Coast scenic attractions. 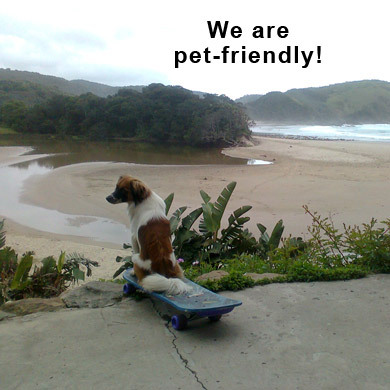 Port St Johns is known as a quirky little town, and we're in the quirkiest part of it - at Second Beach, which is about 5km from the Port St Johns town centre. The ambience is otherworldly, with a certain romance to be found against the backdrop of deeply traditional African culture, some of the continent's greatest natural beauty and a community of vagabond artists and artisans living in scenic splendour. It's a memorably eccentric place - definitely not what you'd experience at home - and many have regarded it as a highlight of their holiday. Two of Port St Johns' favourite restaurants are right next door, with a backpackers pub and restaurant not far up the road. 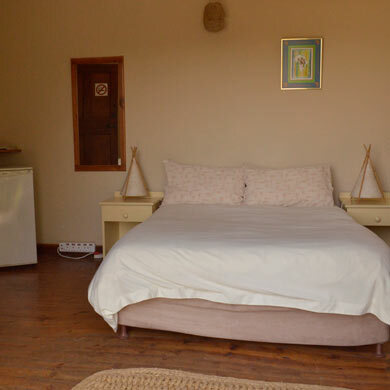 Our accommodation is modest but well-appointed, and all the bedrooms have lovely ocean views. Each has a private shower and toilet. 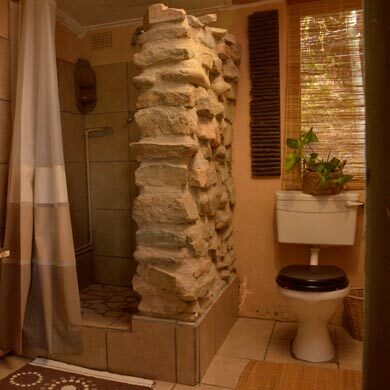 While these are not ensuite, they are just across the passage and are exclusively for your use. In terms of security, we employ a night-watchman and have a fence and large gate. We aren't only about accommodation, and there is plenty to do in the area. 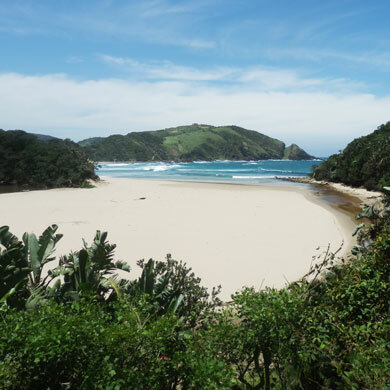 The Wild Coast is known for its unspoilt African beauty, and the start of the Port St Johns to Coffee Bay hiking trail is metres from our front gate, as is the entrance to Silaka Nature Reserve. A short walk around the point takes you to Third Beach, a very secluded beauty spot. There are also jungle walks to Bulolo Waterfall, and for those wanting a glimpse of how the Pondo people live, Mnthumbane Village is located on the clifftops across the bay. Experience one of the secret treasures of Port St Johns by paddling up the Bulolo River in one of our canoes. 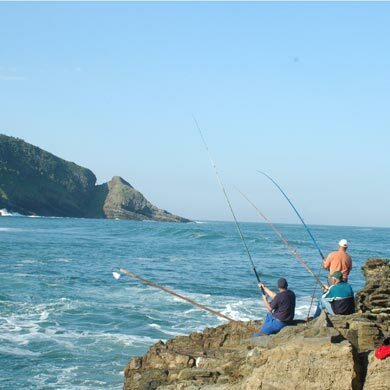 Of course fishing is part of the lifestyle here, with one of the best fishing spots in Port St Johns - "Suckers" - a stone's throw away. The Wild Coast's rugged landscape also makes it an ideal place for mountain biking, trail running and offroad motorcycling. The Wild Coast is famous for shipwrecks. Accounts from the Seventeenth Century relate that many of the survivors liked it here so much that, when given the chance of being rescued and returning home, they preferred to remain cast away on these distant shores. They thought they were in Paradise. We know how those long-ago people felt, and we hope that you will too! Join Mbuyi for Wild Coast tours. Specialising in the 5-day hike from PSJ to Coffee Bay, Mbuyi guides groups of up to 22 hikers, with the trail starting at our gate. 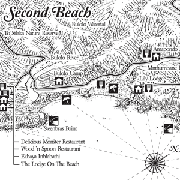 Wood 'n Spoon is one of the best restaurants in Port St Johns, and our next-door neighbour. See their website for pics of their super food, great view and friendly, relaxed vibe. 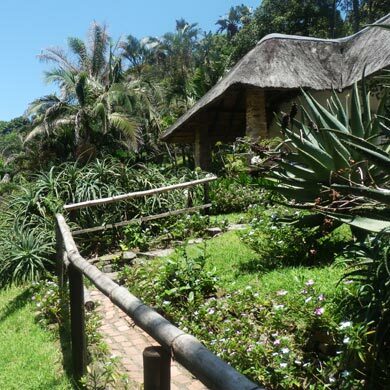 If you're looking for riverside accommodation in Port St Johns, try Bamba Lodge. 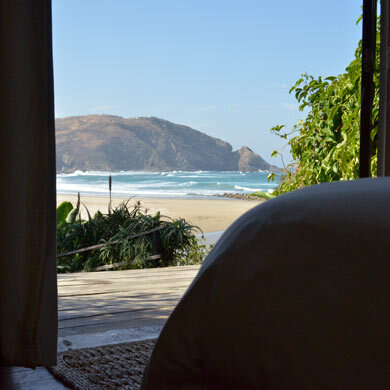 They're situated on the banks of the Mzimvubu River at The Gates of Port St Johns, 5km from the town centre and 10km from Second Beach, and offer ideal accommodation for fishermen, being close to all the north bank fishing spots and with exclusive access to Kob Hole, the deepest point on the Mzimvubu.